Wild Child Stories: Diet Coke Street Style Search! Diet Coke Street Style Search! For those of you in Galway City tomorrow, get yourselves down to the Spanish Arch for some pampering fun, courtesy of Diet Coke! Presenter Lottie Ryan and Diet Coke's pamper pod crew are coming to Galway in search of some of its most stylish people to snap! Lottie is currently on the hunt for Irelands most stylish person, and it could be you! The chosen pictures will be competing against more from around the country, to be crowned Ireland's Street Style Star! So be sure to get your hippest threads on, pop down and say hi to her! 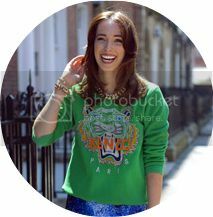 I had the pleasure of meeting Lottie at the U Magazine Highstreet Style Awards two weeks ago and was interviewed by her, and she was an absolute delight to chat to, so I will definitely be going for a look! Now, if the prospect of getting your picture taken in the hopes of being crowned Irelands Most Stylish doesn't tickle your fancy, then the Pamper Pods surely will! Along with having chilled Diet Coke on offer, there will be false eyelashes available and, wait for it, glitter tattoos!! What more could a girl want eh?! Hope to see some of you Galway fashionistas there!